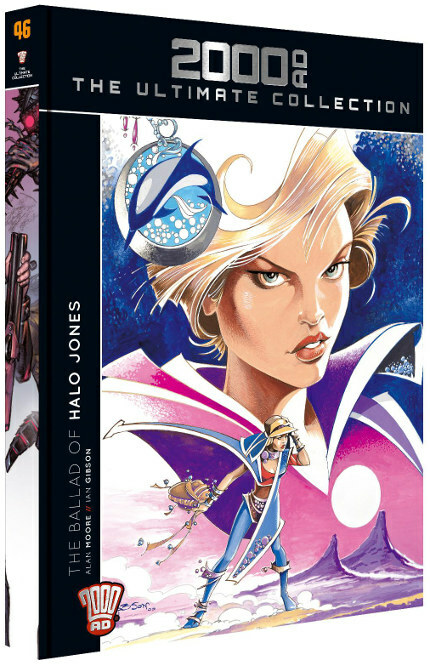 Great news for fans of Alan Moore, Ian Gibson, and/or satirical female-led space-opera: The Ballad Of Halo Jones is being re-released in a fancy hardcover edition, with bonus content, this coming Wednesday (6/9/17) (13/9/17)*… and, because it’s the second issue of a “part-works” series (called 2000 AD: The Ultimate Collection), this handsome tome will be available at newsagents across the UK, for the bargain price of just £6-99!!! To quote the official blurb, TBoHJ is “a powerful tale of one young woman’s attempt to escape the monotony of her life on Earth and seek adventure as she journeys across the galaxy”, which appeared on-and-off in weekly instalments from 1984-6. According to Wikipedia it was “planned to run to nine books, chronicling Halo’s life from adolescence through old age. However, the series was discontinued after three books due to a dispute between Moore and [2000 AD’s] publishers, over the intellectual property rights of the characters [he] and Gibson had co-created.” Sounds about right. * Went in to buy it this morning (7/9/17), and discovered the first issue still sitting there in the box… now the collection’s Wikipedia page has been updated to reveal that the release dates have been pushed back a week… though apparently no one warned the 2000 AD Twitter droid about it either! This entry was posted in Rants about Comics and tagged 2000 AD, Halo Jones, The Ballad Of Halo Jones, The Ultimate Collection. Bookmark the permalink.